BREAK THE CHAINS – MAKE THE DIFFERENCE! 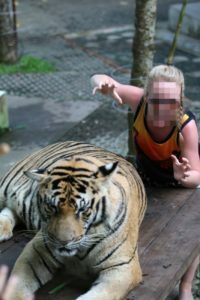 This article is written to expose the cruelty behind irresponsible wildlife tourism. The goal of this article is to stop tourists from supporting wildlife tourism tied to animal abuse, to gain the commitment of travel agencies worldwide to stop selling and promoting unethical tourist attractions, and to persuade local governments to take legal action to help regulate wildlife tourism. 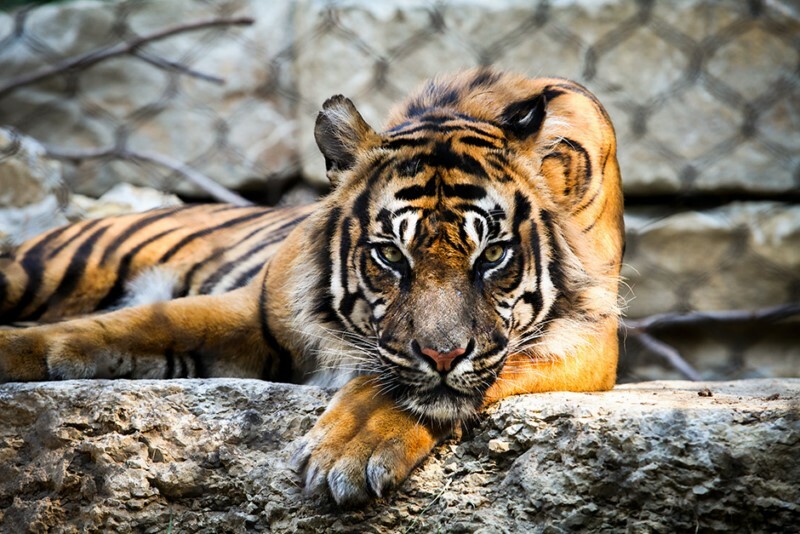 Animal sanctuaries for tigers and lions are popular tourist attractions and are predominantly found in Thailand and South Africa. 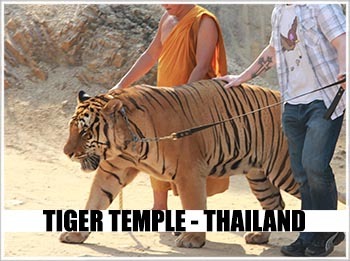 Almost all of the sanctuaries for tigers and lions are commercial breeding industries with profit based objectives. Many tourists believe that sanctuaries help wildlife conservation and that the captive-bred tigers and lions could be returned to the wild. These sanctuaries use misleading, and in many cases even false marketing messages, which causes confusion amongst those seeking to understand the conservation challenges and priorities of tigers and lions. According to a study published in Conservation Biology, it is impossible to successfully re-introduce tigers and lions in the wild. [ii] The cubs are taken from their mothers at young ages and raised by humans. Doing so makes tigers and lions completely reliant on humans for food and care, rendering them virtually unable to fend for themselves in the wild. In addition, the animals are useless for conservation purposes due to rampant inbreeding and poor husbandry. Tiger and lion sanctuaries for tourism operate as businesses like any other industry. And their main objective is to exploit the animals for profit at the animal’s expense. In the country of South Africa lions are being exploited and abused for tourism similar to tigers in Asia. 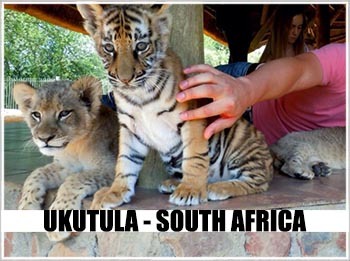 Throughout South Africa there are numerous tourist destinations where one can pet and feed lion cubs, take a walk with lions, and volunteer to raise lion cubs. Many facilities will falsely advertise their center as a sanctuary to help lion conservation by trying to legitimize the exploitation of lions for revenue. Once the lions reach adolescence they are sold to lion ranches where they will likely be killed for canned trophy hunting. A canned lion hunt is a trophy hunt in which the lion is kept in a confined fenced-in area, waiting to be killed by a hunter. The lion cub petting facilities and so-called lion sanctuaries in South Africa are directly linked to canned trophy hunting and not a single lion bred under the current captive conditions has any conservation value.ix Dr. Guy Balme, a leading conservation biologist claims, “there has never been a captive lion successfully released in the wild. It’s been tried on numerous occasions, even to the expense of millions of dollars, but it’s not a valuable conservation option.”[ix] Sadly it’s tourism that plays a major role in promoting all the abusive activities involved with breeding captive bred lions. Lion petting facilities and lion sanctuaries in South Africa prematurely remove lion cubs from their mothers, force lions to be subjected to abuse from tourists, and force the lions to live in overcrowded and unhygienic cages until they are sold as commodities. The big challenge in tackling cruelty to wild animals used for entertainment is to transform the tourism industry. Informing tourists and reducing the demand for these facilities must become part of the solution to end cruelty and protect wildlife. The tourism industry as a whole must take more responsibility for where it sends unknowing tourists and the volunteer recruitment agents need to stop sending unsuspecting student volunteers to these organizations. We can stop animal abuse by refusing to support these industries and by exposing the dark truth of irresponsible wildlife tourism. SHARE THE ARTICLE AND SIGN THE PETITIONS! [i] World Animal Protection. 2014. 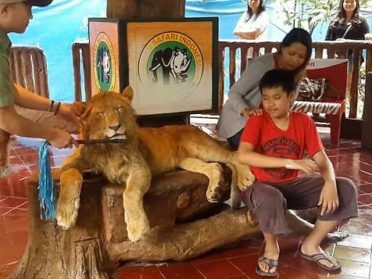 Wildlife on a Tightrope: An overview of wild animals in entertainment in Thailand. [ii] Yiyuan, Qin, and Nyhus J. Philip. “An Assessment of South China Tiger Reintroduction Potential in Hupingshan and Houhe National Nature Reserves, China Vol. 182.” Conservation Biology, Feb. 2015.